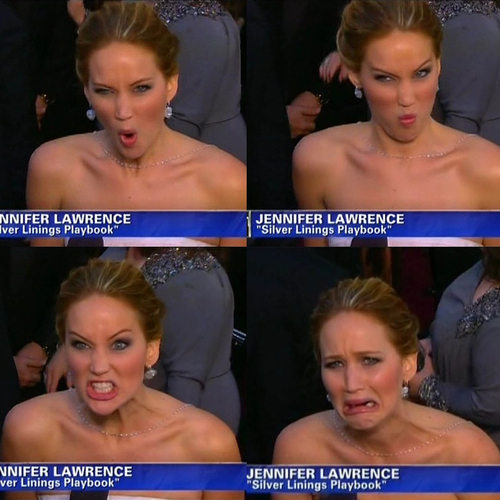 Contrary to what some people think, I actually like Jennifer Lawrence. I don't love her (I didn't like her Hunger Games performance so much) but when I watched Silver Linings Playbook and saw the crazy-eyes scene in the diner and the scene where she mouthed off on Robert de Niro (you don't slap down de Niro and get away with it! ), my thought bubble was, "Oh dear heavens. Best actress in the bag!" Look at that face! Clearly someone who knows how to dig deep within her soul! I am not making fun of her! I'm kinda referring to someone else, more celebrated than Jennifer, a much bigger star but with only one facial expression—like she smelled something bad. Anyway. Where was I? 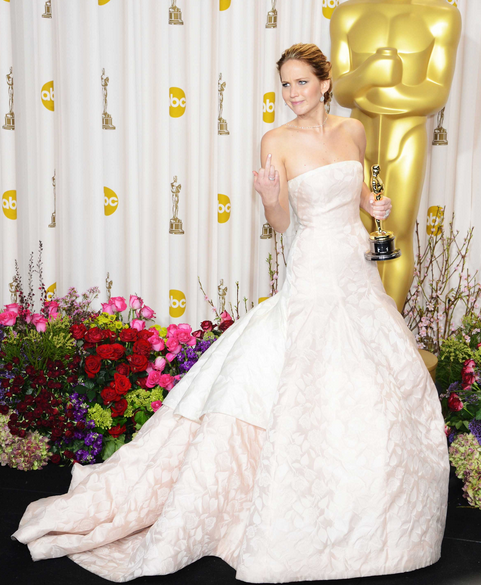 Oh, Jennifer winning the Best Actress Oscar! Am I the only one who thinks Jennifer's fall was adorable? It made her look like she was so overwhelmed at her win that she can't think or walk straight! Love Hugh Jackman (and, just found out, Bradley Cooper, too!) for rushing to her aid. Even her speech was cute! She was dazed, totally having an out-of-body experience. Kinda reminded me of Gwyneth Paltrow, but cuter. Unlike, say, Anne Hathaway, who obviously expected to win because her speech rolled off her tongue so easily. She's so real, my heart aches! Love. Her! Congratulations! You so deserve this! felt bad when she tripped, but what the heck? best actress! hehe. She's so cute especially in that last video. Adorable haha! Were you able to watch the episode of SNL that she hosted? That was fun too! She's my bet too! She is amazing. :) I was telling my husband that in the impossible future when Hugh Jackman and Bradley Cooper are both in my vicinity, I will make it a point to fall so that they can both help me. Haha! A lot of people actually don't like her for being so authentic. New stars are really like that and then as they get more exposed to the biz, they protect themselves and become kinda fake. So... I'm relishing Jennifer's personality now! I liked Naomi, too. But the actor who played her eldest son completely overshadowed her and Ewan!!! So my vote went to Jennifer Lawrence because in that movie, you can't ignore her! I think it's all over Pinterest but here's the link in Youtube. I should watch that! Hindi ba siya depressing? Para kasing sad. Ayoko na ng sad! Hi Frances, I just stumbled by your blog recently and OMG I love it!